Fly down to Phuket and be further amazed by the rules of the road. In Patong you drive on the left for north – south streets but on the right side of the road for east – west streets. Seriously, I’m not making this up. Who would believe it if I was? Speaking on rules of the road, many have observed that there apparently are none in Bangkok. Especially not for motorcycles and the occasional wandering elephant, both of whom go wherever they want, whenever they want and at whatever speed they want. The name Thais have traditionally called their capital city is not Bangkok but actually Krung Thep (or Krungdeb). However its official name as given by King Buddha Yodfa Chulaloke and loosely translated to Roman characters is “Krung Thep Mahanakhon Amon Rattanakosin Mahinthara Yuthaya Mahadilok Phop Noppharat Ratchathani Burirom Udomratchaniwet Mahasathan Amon Phiman Awatan Sathit Sakkathattiya Witsanukam Prasit”, making it officially the longest and weirdest city name in the world. Holidays? You like holidays? Thais love ’em. Officially the country has 15 national holidays, though the government frequently decides on short notice to extend them additional days to avoid the inconvenience of having to work for 1 or 2 days if the official holiday falls on a Tuesday, Wednesday or Thursday. A practice not wholly appreciated by all in the business community. Perhaps the weirdest holiday of all is ‘Constitution Day’, marking the date in 1932 Thailand implemented its first constitution. Since then the constitution has been thrown out the window and completely rewritten many times as a result of military coups or leaders who ‘just didn’t like it’, but nevertheless December 10 remains a holiday whether or not a constitution is in place at the moment. Thailand has long been known for black markets and fake goods. Bangkok now even has as black market for donuts. Yes, donuts. Krispy Kreme opened its first Thai store a few months ago in a downtown shopping mall and became an instant sensation with long waiting lines. Enterprising Thais now hire numbers of people to get in line starting from 6 am and wait for the 10 am opening to purchase the maximum allowed 2 dozen donuts, which are then taken down the street and sold on the sidewalk for twice the store price with no maximum. In a country where the minimum wage is about one US dollar per hour, people actually pay $18 for a dozen donuts. As for fake goods: Thai women have long been noted as some of the most feminine and beautiful in the world. Turns out though a number of them aren’t actually women. Thai politics and government … much too weird for words to describe and it would be pointless to even try. All of this is actually what makes Thailand so much fun. The unexpected and inexplicable arises every day and lies around every corner, with boredom never an option. As with the Thai saying ‘Same Same But Different’, it all makes perfect sense to the Thais while making no sense whatsoever to outsiders. 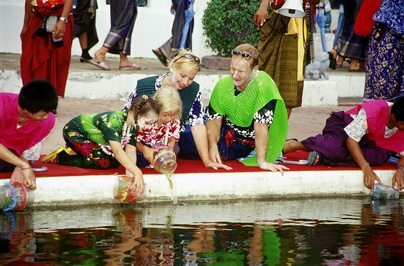 All you can do is do as the Thais themselves do… just smile and ‘go with the flow’.